As reported in other posts on this site, there are many opportunities for beginners to learn the harp. We need now to explore some of the sites that give intermediate players some tips on techniques for bending, developing a good tonal range and playing in different positions just to mention three. I have selected some samples from the popular sites. The intermediate draw bends (2′, 3′, and 3″) are more advanced techniques because it is difficult to hit them cleanly on pitch with good tone. It takes good diaphragm support, resonance, and control of your playing pressure. You need to develop your ear so you know the correct pitches and can easily recognize the note relationships. Repeat these patterns over and over, paying attention to distinguishing the bends in the same hole from each other. It’s good to use a tuner or a piano to check that your are hitting each note on pitch. It is extremely valuable to play simple little tunes you are well familiar with utilizing the intermediate bends, because you know how each note should sound before you play it. For example, try it with “Mary Had a Little Lamb”, and try to make it sound good. Don’t forget that part, making it sound good. Don’t just stumble through the exercise quickly. Take your time with this or some other simple tune, and work to make it sound right, and good. Come back to practice like this from time to time, and see how well you’re doing. Don’t expect to get it sounding good right away, and don’t get discouraged because is “should” be so simple. It’s not easy to play simple things and make them sound good. It’s a major goal. Here’s something a little blusier. As you get better at it, double up on each note and swing the beat. Repeat these each over and over, don’t just play it once and go on. 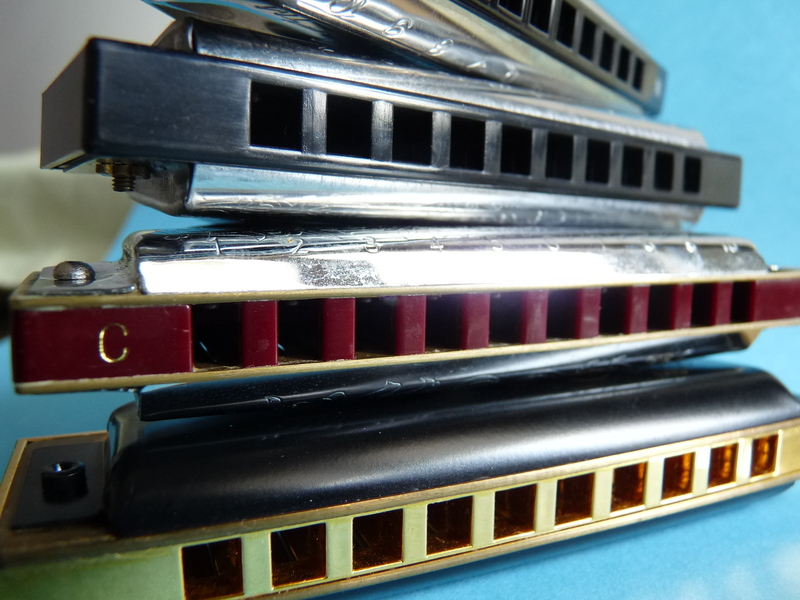 Good harmonica tone sounds good with the rest of the music, and changes according to the demands of the musical expression. Clean single notes. Sloppy play is an enemy of good tone. Playing in tune. This includes draw bends, blow bends, intermediate bends, and overbends–all the note types. Also, the tuning system used, such as equal temperament or just intonation or some compromise between the two, affects the tonal characteristics of passages and chords. Breathing from the diaphragm helps produce a big fat full tone. Resonance works with breathing to produce a loud or complex full bodied tone. Effective use of vibrato works with the rhythm of the music to add variety and life to the sound of a note. Consistency of vibrato through the different note types can be a key to maintaining a cohesive tone through a passage, and mask the playing techniques used to create the note. Consistency among note types in a passage contributes to the sense of a controlled and motivated tone. Single-reed “valve” style closing reed bends. Open airways, including the mouth and throat help get the thick round tone. Pinching of the air stream makes a note weaker and thinner and less confident. Effective hand cupping techniques add resonance and variety and shape to the note. For amplified play, a tight hand cup fattens up the sound, makes the note louder, adds compression, and contributes to a powerful, edgy distortion. A leaky seal makes the note thinner, softer, more shrill, less biting. A poor cup around the harp and mic can be like playing an electric guitar with the amp turned off. A good tight cup is like turning the amp on. Proper equipment for amplification enhances the sound production system–but the player is still the key. If you have poor acoustic tone, expect to have poor amplified tone as well. If you have good acoustic tone you have a chance to get good amplified tone, but you have to master those additional amplified tonal elements as well. Proper amplification and electronic effects to work with the player’s tone to enhance the intended feel of the music. For example, if you’re going for a big fat full tone, don’t use amplification that emphasizes high notes and brittle or piercing sound. If you want to sound like a distorted electric guitar, don’t play through a clean rig like an SM57 through the PA. If you want a clean acoustic sound, don’t hold a bullet mic cupped tight and play through an overdriven guitar amp using effects pedals. Even, consistent, and controlled volume (loudness) for all note types, blown, drawn, bent, or overbent. If your notes are not consistent or controlled as to how loud they are relative to each other, the result will sound chunky, choppy, and strained, and the sense of good tone will be greatly diminished. Good use of dynamics consistently for all note types contributes to an overall sense of good tone. Dynamics is about controlling loudness, softness, and pulsing of volume, and about changes to the loudness–gradually, or suddenly, playing louder or softer, while keeping any pulsing heartbeat intact. Good phrase-related tone adds a sense of cohesiveness and consistency to each phrase and to the music as a whole. 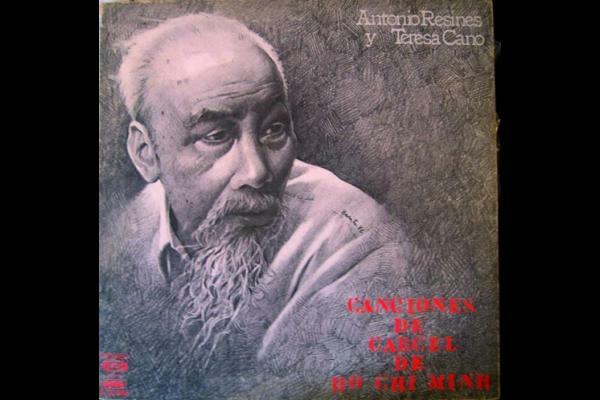 Effective use of variety, especially among musical phrases, to add interest, add spice, add color, and convey different feelings works together with the effective use of consistencywithin musical passages to become the work of musical art painted by the tonal palette and different tonal colors. If you can’t maintain tonal consistency within a passage, you cannot paint a smooth red stroke; if you can’t add variety to your tone, you can only paint in blue. Effective use of the strengths of the differences among the note types–their individual voices and character adds variety and provides expressive capabilities. Elements you may wish to downplay for the sake of consistency sometimes, you may want to emphasize for the sake of expression or variety at other times. Attention to the details of note attack, formation, sustain, and shaping is the key to controlling your tone. Tongue slaps for note articulation can help thicken up the sound with brief chords and add punch to the rhythmic heartbeat of the music. Controlled use of slurs to let in small amounts of air and sound from adjacent holes can thicken up the sound and add tension. Effective use and control of difference tones generated with double-stops (2 notes at a time) can add to the overall sense of musical harmony or dissonance, and thicken up the sound with these created, extra notes. This is an advanced technique that requires very precise control over the bends of both notes when two notes are played at once to “tune” a third note that is automatically generated as a function of the frequencies of the notes being played. Control over difference tones is especially important for amplified play, where the created difference tones are much louder than during acoustic play. Good musicianship in general contributes to the overall sense of good tone. Intermediate players may well like to use available software ..
For INTERMEDIATE and ADVANCED INTERMEDIATE players. A zip file containing a video tutorial and PDF tab for the harmonica intro to Junior Wells’s and Buddy Guy’s “Early in the Morning,” from the HOODOO MAN BLUES album. Transcribed and adapted by Adam Gussow of Satan and Adam. This is a special introductory lesson, priced at a special rate. (The tab sheet covers only five bars’ worth of music, but they’re a densely packed five bars.) The video takes extra time to explain the Gussow tabbing format. 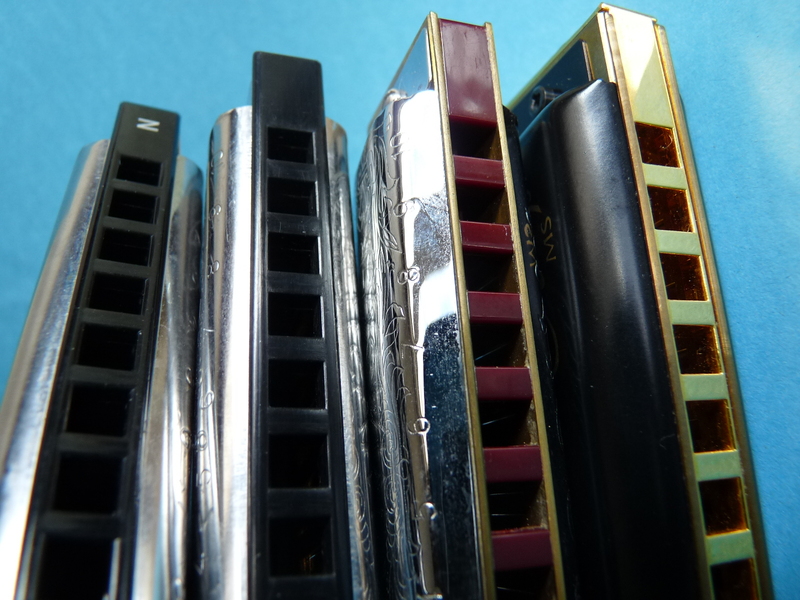 Players new to Modern Blues Harmonica will get a good sense of my teaching method; others will find a surprisingly challenging workout that helps them master a very useful 12-bar slow blues intro. Technical challenges include 2, 3, and 4 draw bends and tongue blocking. And some more insights for the intermediate player: find your space in a song…..
“Number and Arrow” system of notation– The “up” arrows indicate blow (exhale) notes and the “down” arrows are for the draw (inhale) notes- The little “b’s” under the bent arrows are flat signs. One “b” is a half step bend and two “b’s” are a whole step bend (as shown in the graphic below).The number and arrow system. All riffs are played in the 2nd position– For more information on 2nd position, visit the General Overview section. Use your own timing– Except for the triplet riffs, you can use your own timing with these riffs to make them fit into whatever song you are playing with. Listen to the sound file below the riffs to help get you started. Problem with the hole 2 draw– If you have a problem with the hole 2 draw you can substitute the hole 3 blow until you have the ability to make the hole 2 draw come out correctly. For Intermediate and Advanced players– you can add a 4 draw bend between the 4 blow and the 4 draw of the “Almost Blues Scale” riff. This will make it a complete one octave blues scale. “Jam-To” Blues MIDI File– If you would like a quick, easy background song to begin jamming to, you can use the “Jam-To” MIDI File in “G” to try out the different riffs and ideas outlined here. Additional MIDI files are also available. 1. Place harp deep in mouth. 3. Keep the upper lip relaxed and deep. This technique will act as a foundation for almost everything to come, so if you not confident with this technique please review. Click here to go back to Level 1 – Step 1 to review in depth. The next two rhythms are designed to teach your tongue to dance. The “T” and the “K” sounds can create well-defined rhythmic accents that will enable you to play at high speeds. The “T” sound creates an accent in the front of the mouth, and how the “K” sound creates an accent in the back of the mouth. I like to think of the “T” and the “K” sounds as the harmonica player’s drumsticks. When you effectively learn to combine the two sounds you can increase your speed dramatically. For tone you should really listen to Paul Lamb (see below) he spent some time with Sonny Terry and believes tone is what separates the musician from the harp player who can only play amplified. Happy Birthday Uncle Ho! 19 May 1890 – 3 September 1969. 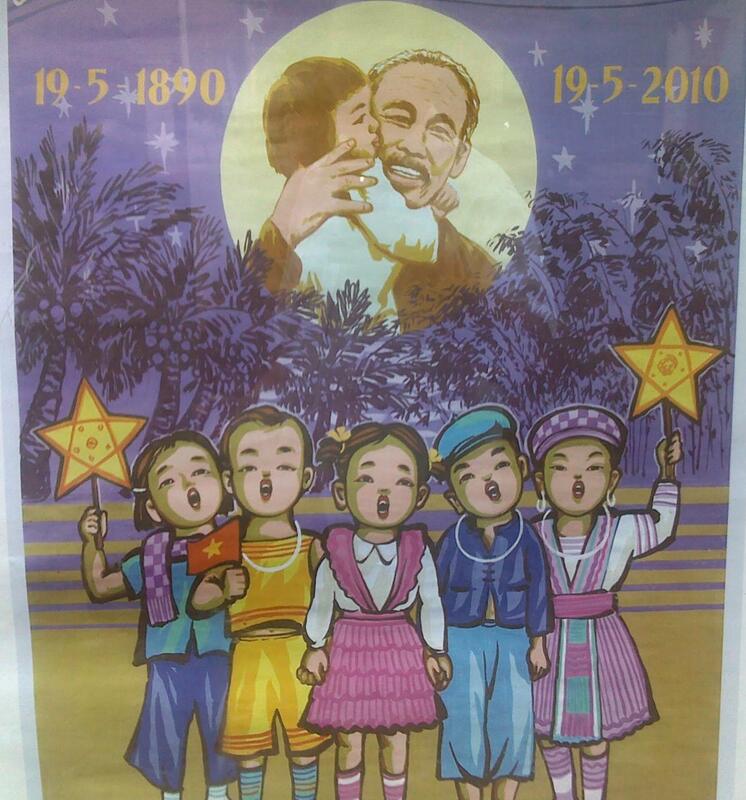 Living in Vietnam, you are often confronted with images of Uncle Ho cradling a child with images surrounding him of soldiers, nurses and teachers . 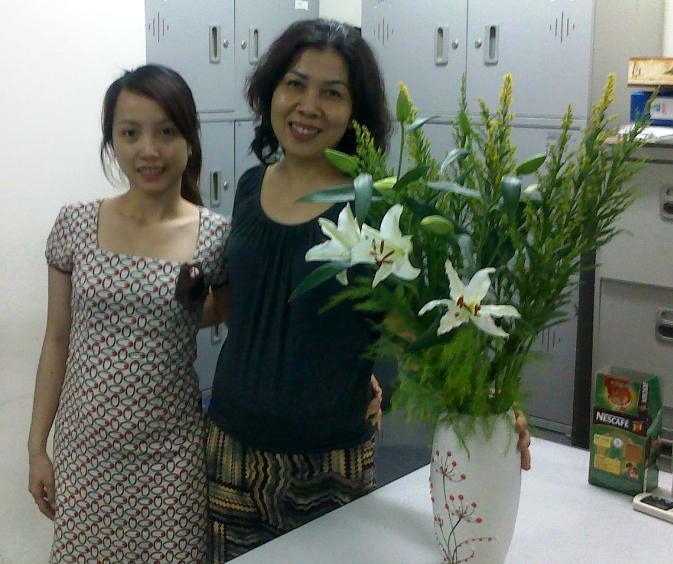 Well , today someone had brought in a large bunch of flowers into the office, to celebrate the birthday of the much venerated Hồ Chí Minh or uncle/tonton Ho. So, Happy Birthday Uncle Ho! 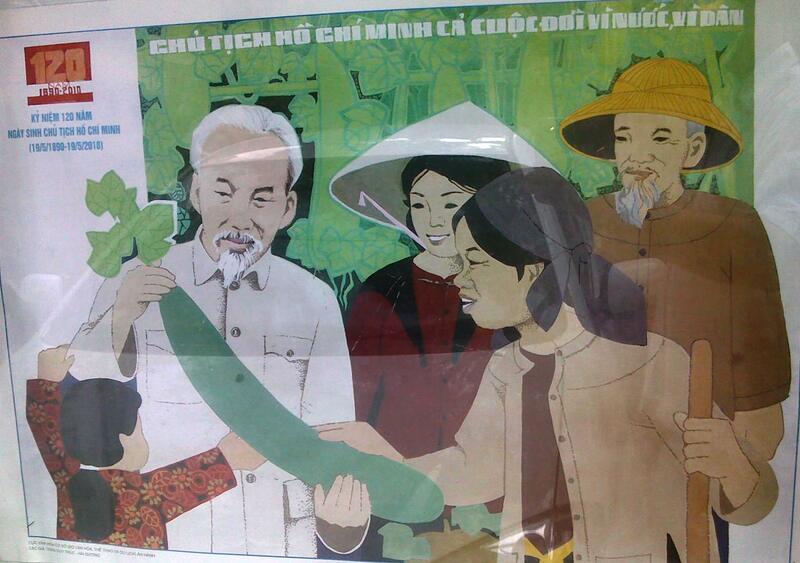 Hồ Chí Minh , born Nguyễn Sinh Cung and also known as Nguyễn Ái Quốc (19 May 1890 – 3 September 1969) was aVietnamese Communist revolutionary and statesman who was prime minister (1946–1955) and president (1945–1969) of the Democratic Republic of Vietnam (North Vietnam). 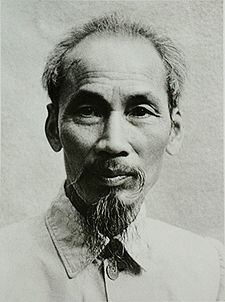 Hồ led the Viet Minh independence movement from 1941 onward, establishing the communist-governed Democratic Republic of Vietnam in 1945 and defeating the French Union in 1954 atDien Bien Phu. After helping drive the French out of Vietnam in the mid-1950s, Ho was widely expected to be elected head of a unified Vietnam; however, the United States refused to let the election happen and Ho began to support the attempts of rebel forces in South Vietnam to overthrow the American-backed government. 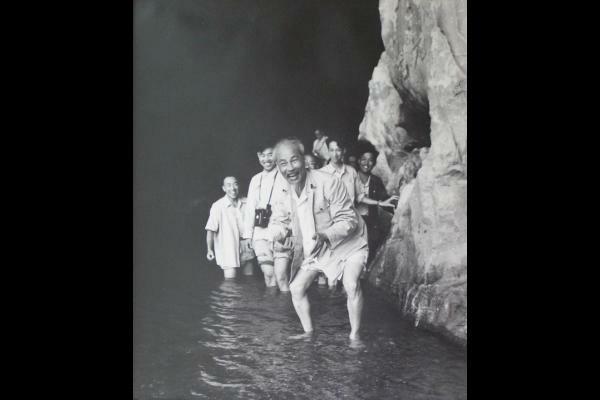 He lost political power inside North Vietnam in the late 1950s, but remained as the highly visible figurehead president until his death. 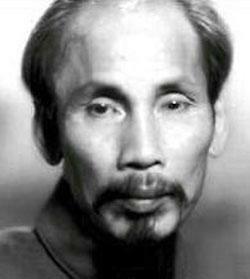 During the Vietnam War, Ho lived in Hanoi, where he died in 1969, before seeing the unification of Vietnam. 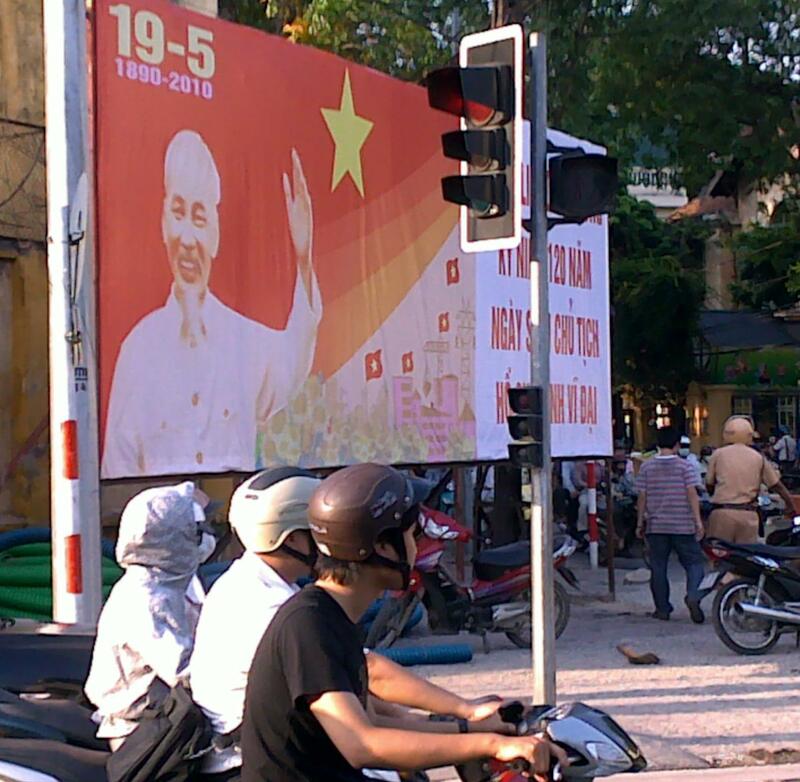 The former capital of South Vietnam, Saigon, after the Fall of Saigon, was renamed Hồ Chí Minh City in his honor. Submit Photos to Shutterstock and make $$$!